Imagine yurt-like structures made of elephant tusks. Then shift your vision to bright-green pools of lithium in a middle-of-nowhere desert, with pipes flowing the alien-looking liquid from one area to an adjacent one. Grimy machinery forges red-hot iron shapes then cools the metal objects in pools with nary a human hand. These images, together, may seem like they’re from a space western or a novel set in a dystopian future, but they’re contemporary, real-life images from Earth, depicted in Sundance documentary Anthropocene: The Human Epoch. 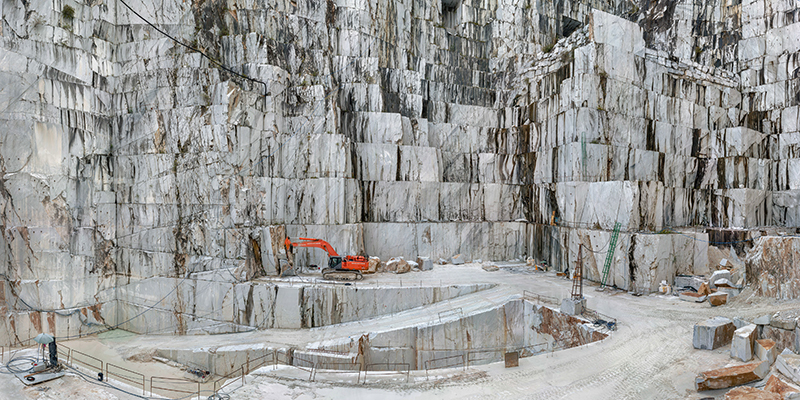 A film by directors Jennifer Baichwal, Nicholas de Pencier and Edward Burtynsky, Anthropocene: The Human Epoch takes a wide look at the ways humans have changed the natural makeup of the planet. Anthropocene itself is a term derived from an intellectual movement in the field of geology. While the Holocene Epoch is the official period that the powers-that-be recognize as defining our current times, a team of scientists have studied human impacts on the earth from 2009 until now. They argue that we have now breached the Anthropocene Epoch, wherein human activity rapidly determines various states of the planet, which were once left to gradual environmental factors. Anthropocene: The Human Epoch hereby surveys extreme intrusions that we’ve made on and in the land, underwater and through the sheer reshaping of the natural world around us in an otherworldly, largely visual essay. In addition to the aforementioned scenes, Anthropocene: The Human Epoch examines open mines, terraforming sites and veritable cities of trash, mainly comprising plastic waste. Areas such as these exist throughout the globe, from continent to continent, from rich countries to poor ones. The film’s principal method of communicating the scale of these man-made excavations/pollutions is to start with a relatively tight shot. The camera often moves about the scene to place viewers in the setting with a perceivable sense of scale, which illuminates how unnatural and strange human activity and industry are in all of their permutations. When sucked into each scene’s context, it feels vast and unnerving. But even the aerial, wide shots of machinery moving and breaking the earth help convey the far-reaching perils of the activities in Anthropocene: The Human Epoch. The documentary couples its vivid, crushing imagery with well-placed information about the whopping numbers from measurements of chemical levels in and of the earth, the heat of the ocean—which has been killing coral reef—and the trillions of tons of synthetic materials that occupy space on the planet, etc. Anthropocene: The Human Epoch succeeds in not trying to assail each topic but giving us a panoramic view of how all of these human activities cumulatively affect the planet. I was curious as to how each intrusion directly affects the earth’s systems, but I also understand that this film is a mosaic, and delving too much into the consequences of one problem may have created an imbalance. Probably the most profound impression I get from this documentary is that all of these human-created phenomena exist in a nearly inhuman capacity. Or, perhaps they’re so human that our operations have fallen far away from our traditional concept of the natural order. Robotic machinery seems like footage from a Star Wars film; the green lithium reservoirs seem like its harvesters are wading in gaseous matter; and even people working in these scenarios seem mechanized. It’s almost as if Anthropocene: The Human Epoch suggests that our collective unconscious has directed us into a manic drive for self-preservation, regardless of the external ramifications, a suicide mission. Read more of SLUG‘s comprehensive coverage of the 2019 Sundance Film Festival.